What a magical time of year besides the Summer Solstice we also have a New Super Moon on top of it! The summer solstice is June 21 – 22 and the New Super Moon is on June 23. Our June 23/24, 2017 Cancer New Moon, falling after our Summer/Winter Solstice on June 20/21, heralds a welcome relief of a little nurturing, some tender ‘mothering’ and a gentle soft respite into ourselves. I am offering A Summer Solstice reading combined with a New Moon reading which will take you on a magical journey of self involving the elements and the Angels. This reading harnesses the special energy that the Summer Solstice is bringing your way. This Reading is a powerful opportunity for reflection during the excitement of midsummer’s magic, manifestation, and abundance. The New Moon is a time of new beginnings, hope, faith and optimism. It is an important night energy wise as it sets the pace for the entire lunar cycle. This means it’s also a great time to check in and see how things are going in your life. Find out what energy this New Moon will bring you. Ask your Guides and Angels what you should be working with this lunar cycle and what you should let go. I am Offering this Special Reading at a Discounted Price. Normally $75.00 Discounted to $60.00. Plant your intentions for the next Lunar cycle Now! Beneath the Power of the Moon, we sit in the Silence of Being and Hold the Light Our Souls Know so Well. This month we get a double blessing in that the Full Moon and the Summer Solstice are on the same day June 20. Take advantage of the spiritual blessings that are pouring out at this time. The full moon is on June 20, 2016 11:02 UTC in Sagittarius and the Sun is in Gemini. This is commonly called the Strawberry Moon – This name was universal to every Algonquin tribe. However, in Europe they called it the Rose Moon. Also because the relatively short season for harvesting strawberries comes each year during the month of June . . . so the full Moon that occurs during that month was christened for the strawberry! With so much activity happening in the spiritual realm this is a wonderful time to get the Spiritual Full Moon Reading. This is unlike anything you have ever had before, as I tell you what is ahead during this month cycle. There’s no need for questions as you will receive all your answers from Spirit. Those who have taken advantage of this special reading know how valuable it really is. Click Here To Find Out More. Welcome the first day of summer and the longest day of the year. Take time to enjoy the wonderful gift of a new season! The solstice heralds the beginning of summer in the Northern Hemisphere on June 20, 2016 at 6:34 p.m. EDT. The summer solstice is the longest day of the year and the first day of summer. While those in the Northern Hemisphere cover up with sunscreen, residents in the Southern Hemisphere will be wrapping up in their warm clothes in honor of the winter solstice — the shortest day of the year and official start of winter. Stepping into sacred time is becoming more and more important to our success as spiritual entrepreneurs. Focus on what you want to accomplish over the next few months that will bring peace and happiness into your life. Stay out of your head as much as possible. Be more of an observer of your thoughts than the thinker of them. Quiet your mind and spend time in nature reconnecting yourself. This is where summer can be a very healing time. Every single line of energy we have in our bodies and light bodies is being opened, expanded and utilized right now – and some of these energy lines have never been opened up inside of us in this way before. So it can feel a little startling, disconcerting, even bring up anger or frustration. It can also make you feel euphoric, energized, and like your gifts are being magnified – because they are. We are receiving yet another upgrade to our human and light systems. In other words, our cellular structure is being prepared very quickly, in time for this new energy that Summer Solstice and a number of other celestial events are bringing in. Our spirits are being more fully integrated with our bodies. For some of you it’s happening right now and for some, it will happen closer to or on or just after Summer Solstice. You know how this whole year so far has been an acceleration of your release of all that does not serve you? Well, right now, it’s as if we’re being squeezed and internally shifted to facilitate the massive release of what remains that needs to leave us. If ever there was a time to let go and allow… that time is now. The more you resist it, or live in your head about it, the harder it will feel. The more you can allow this energetic/spiritual/physical upgrade, the easier and more amazing you will experience your transformation and success. The Summer Solstice is called Midsummer or Litha in some medieval and Craft traditions; and Alban Hefin or Alban Heruin in other Celtic and Druidic traditions. In the mythical cycle, this is the end of the reign of the Oak King, and the beginning of the Holly King’s rule. 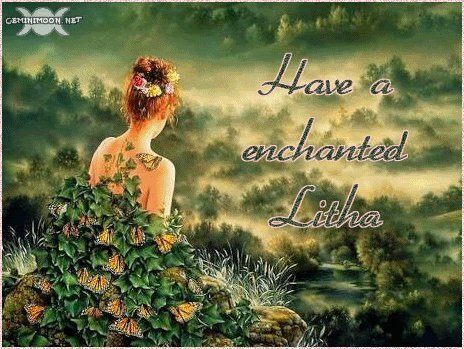 Litha is a time of great magical power. All forms of Sun magic are going to be amplified, and especially effective for love, healing and prosperity. This is also a very good time to perform blessings for your pets and home. May the children of Earth awaken, rise up, and be about healing and blessing we need to give one another, and for our holy Mother Earth, our home. In the way of our ancestors, we honor the Turning. Awed by the great power of the sun, civilizations have for centuries celebrated the first day of summer otherwise known as the Summer Solstice, Midsummer (see Shakespeare), St. John’s Day, or Litha. The Celts and Slavs celebrated the first day of summer with dancing and bonfires to help increase the sun’s energy. The Chinese marked the day by honoring Li, the Chinese Goddess of Light. In ancient Egypt, the Solstice heralds the New Year. In Ancient Egypt, the summer solstice preceded the appearance of the Sirius star, which the Egyptians believed was responsible for the annual flooding of the Nile that they relied upon for agriculture. Because of this, the Egyptian calendar was set so that the start of the year coincided with the appearance of Sirius, just after the solstice. Chinese believed, the powers of yin and yang waxed and waned in reverse proportion to each other. At the summer solstice, the influence of yang was at its height, but the celebration centered on the impending switch to yin. At the winter solstice, the opposite switch was honored. Today, the day is still celebrated around the world – most notably in England at Stonehenge and Avebury, where thousands gather to welcome the sunrise on the Summer Solstice. Stonehenge is an ancient prehistoric site and has been a place of worship and celebration at the time of Summer Solstice since time immemorial. Pagans called the Midsummer moon the “Honey Moon” for the mead made from fermented honey that was part of wedding ceremonies performed at the Summer Solstice. Ancient Pagans celebrated Midsummer with bonfires, when couples would leap through the flames, believing their crops would grow as high as the couples were able to jump. Midsummer was thought to be a time of magic, when evil spirits were said to appear. To thwart them, Pagans often wore protective garlands of herbs and flowers. One of the most powerful of them was a plant called ‘chase-devil’, which is known today as St. John’s Wort and still used by modern herbalists as a mood stabilizer. Now is the perfect time to connect to the Earth’s Energy. If you have wanted to make changes in your life is never too late to create a new you! Stay out of your head as much as possible. Be more of an observer of your thoughts than the thinker of them. Quiet your mind and spend time in nature reconnecting yourself. This is where summer can be a very healing time. In ancient Egypt, the Solstice herald the New Year. In Ancient Egypt, the summer solstice preceded the appearance of the Sirius star, which the Egyptians believed was responsible for the annual flooding of the Nile that they relied upon for agriculture. Because of this, the Egyptian calendar was set so that the start of the year coincided with the appearance of Sirius, just after the solstice. The ancient Chinese honored the Yin on the Solstice In ancient China, the summer solstice was the yin to the winter solstice’s yang—literally. Throughout the year, the Chinese believed, the powers of yin and yang waxed and waned in reverse proportion to each other. At the summer solstice, the influence of yang was at its height, but the celebration centered on the impending switch to yin. At the winter solstice, the opposite switch was honored. Now is the perfect time to connect to the Earth’s Energy. If you have wanted to make changes in your life is never too late to create a new you ! Today we celebrate the ending of the waxing year and the beginning of the waning year, in preparation for the harvest to come. Midsummer is when all may absorb the Sun’s warming rays and it is a celebration of fertility, not only for humans, but also for crops, animals and all beings. Litha is a time of great magical power. All forms of Sun magic are going to be amplified, and especially effective are spells for love, healing and prosperity. This is also a very good time to perform blessings for your pets and home.